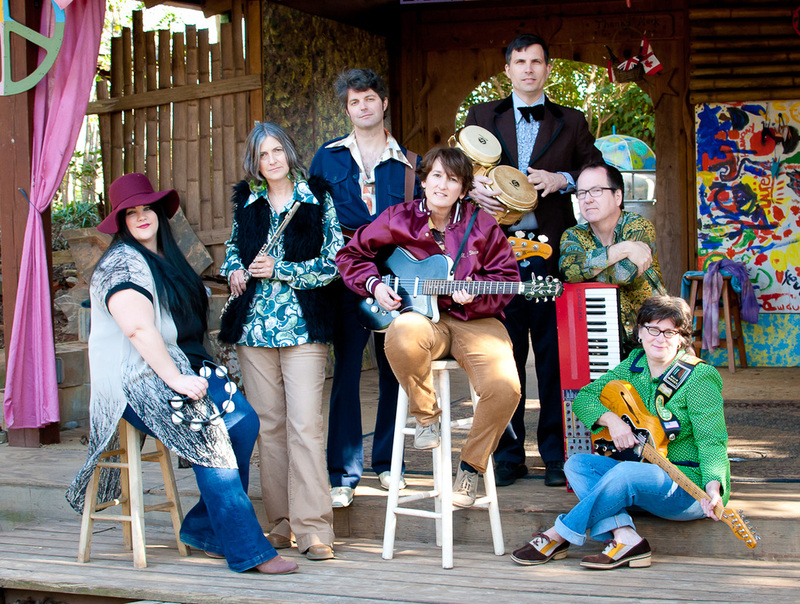 We, the Susi French Connection, are a group of seven Atlantans who started playing 70’s songs in 2000. Three of us used to be in a band called the Gentle Readers and after several albums of original music, we decided to do a show of covers we liked and we called in friends to help us and now we are only the Susi French Connection and it is fifteen years later. We generally play every other month, either at a private event or a club. We now use Google Calendar to keep track of each other and that helps, but seven is a lot of people to organize. If you are considering starting a band, save yourself some heartache and leave out the drummer. No – just kidding – have three people in your band that are single and make them promise never to mate or acquire a mortgage. Susan, Lee, Greg and Becky are founding members of the Susi French Connection, and keyboardist Allen Broyles replaced Brandon Bush in 2005. He says he still feels like the newbie, but that honor really goes to Scott Hamilton (drums) and Lynne Tanzer (singer), both of whom began playing with us in 2014. Finally, no one in the band is named Susi French, though she is a real person that we know and she lives in a different state. She does know we’re using her name. Susan Fitzsimmons: Vocals, guitar – Susan works in the technology industry, is a bee keeper, enjoys cooking and travel, and IU basketball. She and Lee moved down from Indianapolis to start a band in 1991. Greg Partridge: Bass – Greg does video editing and some audio engineering and he is athletic and newly married (for the first time). He is our de facto musical director and is in every way the most reliable of us. He has a music degree from Georgia State. Becky Shaw: Vocals, harmonica, accordion, percussion, keyboards – Becky also plays guitar and sings in the wonderful string band Roxie Watson and she’s currently working on a solo record, finally. Her background is in mental health, which comes in handy. Allen Broyles: Keyboards – Like Becky, Allen can play just about any instrument he picks up. He’s the headmaster of a private school and he’s into what makes people learn and how brains work and all that. He was in the Josh Joplin Group for a long time. Scott Hamilton: Drums – Scott too is a multi-instrumentalist who spends a lot of time working in his home studio. He’s a deep thinker, a high school principal, and completely unflappable. Lynne Tanzer: Vocals – A budding diva (the good kind), Lynne is a youngster and Brit, so half of what we learn she’s never heard before. She is trained as a professional makeup artist and just added #2 to her pack, Sal.